Manchester Metrolink 1007 was, as explained in the text below, the first second generation tram in the United Kingdom to run on the streets. In this view we see 1007 at St Peter's Square in Manchester city centre on 8 April 2003 with its new livery, the same as on second series trams on the network. Manchester Metrolink 1007 was the first new generation vehicle to operate on the streets of Britian. It was deliberately chosen by Metrolink to perform this duty on 27 April 1992 as back in January 1949 the identically numbered 1007 was the last original tram to operate in Manchester. So Metrolink 1007 followed in its ancestors footsteps and carried the very same headboard as seen over 40 years previously. The tram started off life in 1991-2 and was built mainly in Italy by Firema and was part of the original batch of 26 vehicles. There are 3 bogies fitted to the tram with the two outer ones having 2 motors a piece and there is a seating capacity of 86 with further room for another 122 to stand. The top speed the tram can get to is 50mph on the former train sections to Bury and Altrincham with a more sedate 30mph allowed on the streets. The tram cost less that £1 million, seen as good value at the timeas other European systems were spending well over a million on similar trams. Unlike 3 of its sisters 1007 was not selected to be slightly modified for use on the second phase of Metrolink to Eccles and so remains in near original condition. Interestingly the official book on Metrolink released at the time of opening notes that the trams are scheduled for major overhaul after 10 years of operation, something which has now passed. 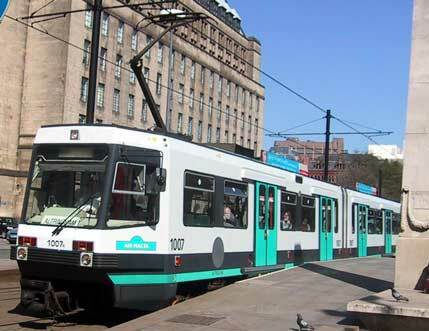 The tram has now become the first of the first series vehicles to receive a livery modification with the doors painted the turquoise green, like the second series trams. British Trams Online is an enthusiast run website for enthusiasts. It should be able to be viewed at all screen resolutions but I do advise you that it is probably best at 1024x768. The site is owned, maintained (and in the main written) by Gareth Prior. Any comments or suggestions please email.